In general almost every home has at least one bathtub. The way that the bathtub is shaped and sized will largely depend on the space that is available to work with. If you have a small bathroom it is likely that you will choose corner bathtubs for your home. Corner bathtubs make use of space in the room that is usually wasted. By using this space you will save room in your bathroom for other items. Those that use standard bathtubs will find that they can sometimes be big and bulky. Corner tubs can offer homeowners a versatile solution for small bathrooms. These tubs also come with special features that allow decorators to get a little creative in terms of decor. 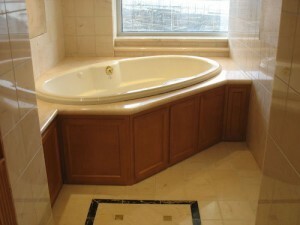 One of the biggest benefits of corner bathtubs is that they do not cost as much as standard tubs. These small bathtubs are created from a lightweight and cost-effective acrylic. Because of the material that is used to make them the cost of the entire tub is cheaper than the alternatives. This style of bathtub is a great option for those that are looking for a cheap space saving versatile alternative to regular bathtubs. Buyers should take a look at online renovation stores and see how these tubs stack up against other makes and models. Generally there will be a wide range of styles and colors that the buyer can pick from. The whole process will be quick and easy as even installation is simple due to the tubs being so lightweight. By saving space in the bathroom buyers can use that space for other items such as vanities, storage or even just a little room to move around in. Those that live in small spaces will be pleased to learn that they can enjoy the luxury of a bathtub and still have room to decorate their bathrooms.